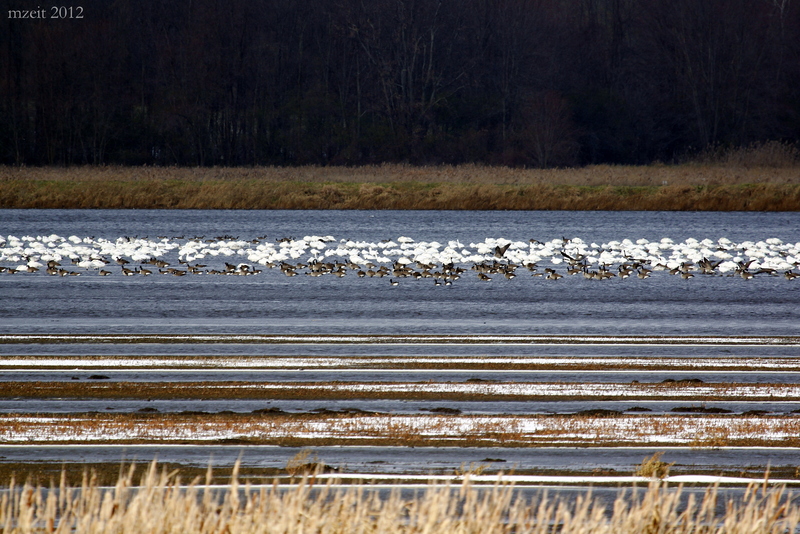 Canada Geese, Snow Geese, Tundra Swans, and Trumpeter Swans way off in the distance, Montezuma NWR 11-24-12. So I looked over my photos and did some reading, and it seems like even for experienced birders, it is not very easy to tell the two species apart. One of the best guides that I found for identifying the two species can be found on the Sibley Guides website. I particularly like the drawing on this page that compares the head of the Trumpeter to that of the Tundra. David Sibley focuses on what he calls “bill-shape field marks”, and this certainly what was most helpful for me as I went through my photos and tried to identify them. I also spent a lot of time on the Trumpeter Swan Society‘s page. They have a Swan and Goose Identification Brochure that is very informative and it is printable. 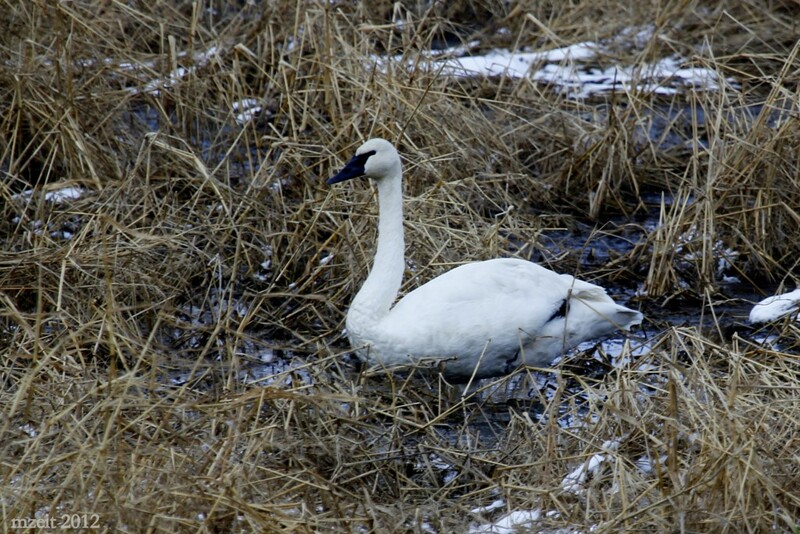 There is a small yellow spot on the bill, in front of the eye for 90% of Tundra Swans. In the above picture you can see this on the front bird (looking left), while it can’t easily be seen in the back bird (in other photos of the back bird, it can be seen but only very faintly). The remaining 10% percent have all black bills – just like Trumpeter Swans. When seen in profile, the bill has a slight curve to it and the connection from the bill to the eye is slight; it almost comes to a point. The bird on the left in the above photo illustrates both aspects nicely. When viewed head-on or top-down, where the bill meets the head and connects the eyes is rounded. I did not get a photo from this angle, so click here for photos by Mike Cooper that illustrate this view. The shape of the head – the Tundra has a more rounded head that rises up a bit at the crown. The slope of Trumpeter crown more closely matches bill slope. 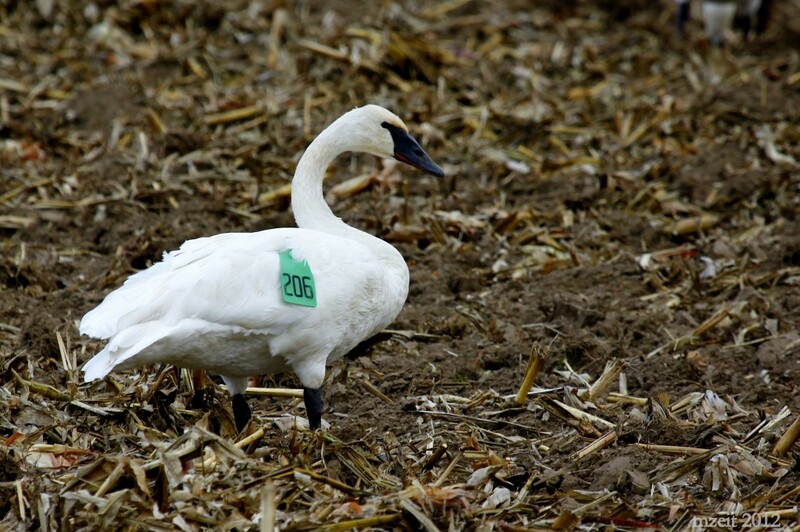 Trumpeter Swan with a wing tag. I reported this bird to the USGS Bird Banding Lab. All black bill that is a bit larger in proportion the head as compared to the Tundra Swan. When seen in profile, the bill appears pretty straight and where the bill meets the eye is a heavier connection. Most of my photos are in profile and for me this was very helpful. When viewed head-on or top-down, where the bill meets the head and connects the eyes is pointed. You can see this a bit in my photo below, or you can click here for the photos by Mike Cooper that illustrate this view. The shape of the head – the crown of the Trumpeter Swan’s head more closely matches the slope of the bill. The back of the head is not rounded like the Tundra’s, rather it drops off more sharply. Trumpeter Swan at Puddler Marsh, Montezuma NWR 11-24-12. Trumpeter Swans or Tundra Swans? 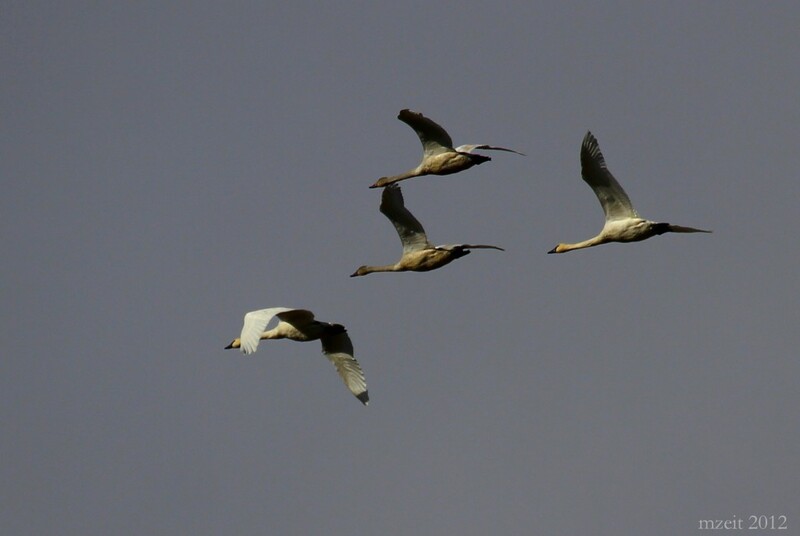 Identifying these birds in flight is another matter! 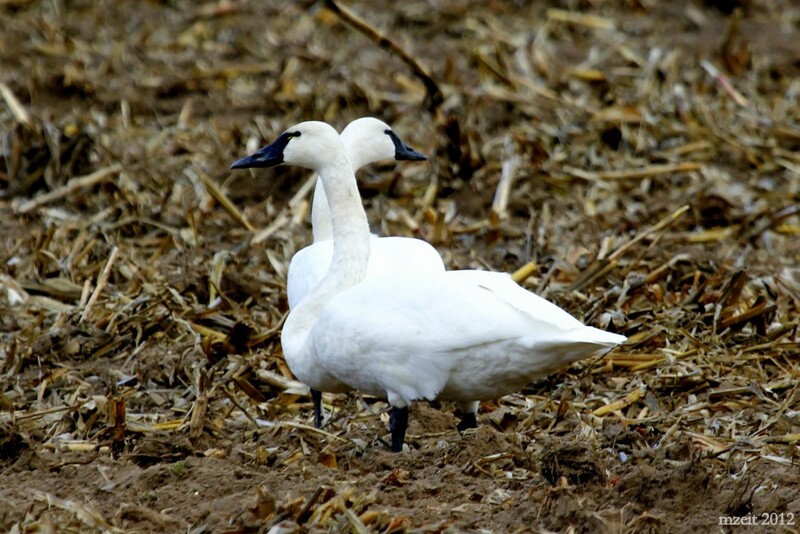 If I had to guess for the above birds, I would say they are Trumpeter Swans – for two reasons. 1 – if I zoom in on the heads of these birds it looks like there is a substantial connection between the bill and the eye. 2 – I read somewhere in the past couple of days that you are more likely to see Trumpeters in small groups like this and Tundra Swans are likely to be in larger groups of 20 or so birds. 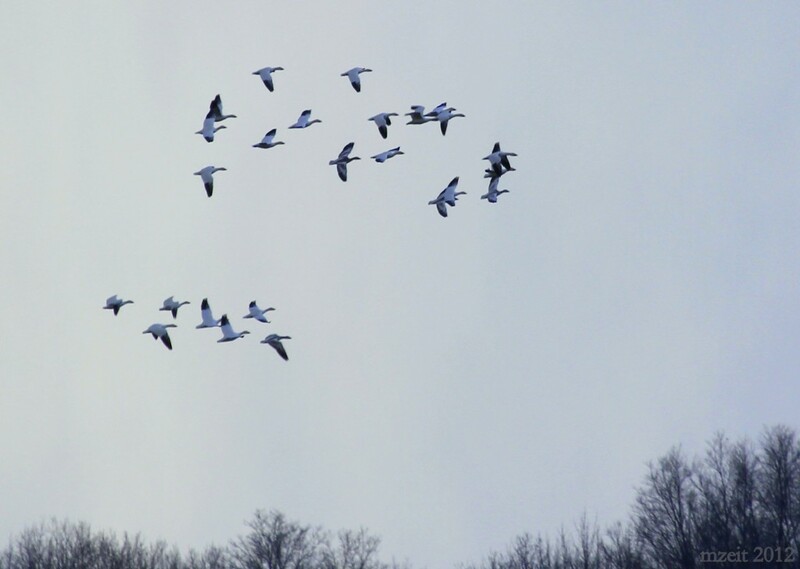 Snow Geese fly over Montezuma NWR 11-24-12. Seeing these swans would be exciting for me. Great pictures, Matt, and a little bit of education, too! Thanks Karen, it was really cool to see these birds and it was a lot of fun to do the research to try and get the correct identifications. There is something about seeing bird white birds flying over, very magical. Love the GBH picture, and the crossbills, too. You’re getting in some great birding time. Lucky you! !